Sears Roebuck helped homesteading happen quite by accident, but it happened at a time when the entrepreneurial and inventive spirit of Americans was pulsing fast, and homesteading was on the map. It was a time when new states were waiting to be formed—there were only 30 then—a time when the poor man’s energy could be directed to grabbing land, starting farms, establishing homesteads on the Great Plains, all for a few dollars down and nothing left to pay but sweat equity. And men with a bit of luck and capital were opening businesses that took advantage of the poor man’s dreams. Suddenly, the wars were over, democracy was safe, immigrants were pouring in to enjoy newfound freedoms, and city folks in cramped quarters were going west in droves for a taste of the wide-open spaces. Hand in hand with the Homestead Acts and westward expansion were the railroads crisscrossing the country, and alongside each one, telegraph lines. Prosperity was the buzzword of the day. Significant to our story was the institution of time zones. When our nation was new, time was decided by local agreement; it was a hometown, friendly kind of thing, chimed out by a central clock on the town hall or the biggest church. But then came railroads, and railroads couldn’t run by the whims of the sun; they needed schedules that businesses (and governments) could count on—so all over the world, human, natural, solar time yielded to the demands of commerce. Time zones were such a hotly contested matter that even the date when time zones came into official existence has been disputed, but the general agreement is that on Sunday, November 18, 1883, also called “The Day of Two Noons,” America’s railroad station’s clocks were reset to a standard-time noon in each of four newly formed zones, now called Eastern, Central, Mountain, and Pacific. In 1886, Richard Sears had a good job as a railroad station agent in North Redwood (now Redwood Falls), Minnesota. In charge of goods going in and out, he found himself the recipient of a package of watches that was being returned to sender. Apparently a local jeweler had been the victim of a common scam–—wholesaler delivers to retailer an already marked-up item that the retailer never ordered, and retailer falls for it, marking the item up even higher to the consumer. Already a chancer who sold lumber and coal on the side, Sears took another chance and paid for the package at the inflated wholesale rate. He boldly sold off the watches off to locals—friends, family, people who trusted him—but at a price lower than the usual retail, relying on sales quantity for his own smaller gain. Farmers needed watches suddenly, as much as city slickers, because they had to know when goods would arrive and leave by train. And there was a general mistrust of the high prices charged by local small merchants. Sears mopped up with his new business. He began to realize that there was a solid commercial principle at play here: buy in major bulk and sell in major bulk. The secret was wide distribution. He could get the edge on local specialty stores by charging less—but there would still be a reasonable profit to be made. Not long after, he put out an ad for a watch repairer, and Alvah C. Roebuck applied. Thus from a simple watch company offering repairs on any returned product, Sears Roebuck and Company (still the official corporate name) was born. Roebuck was an inventor and tinkerer (he sold-out early-on for a mere $20,000, proving his lack of financial instinct, while Sears was a businessman through and through. Sears had been raised on a farm and knew the needs of rural people; combining that with his understanding of the railway system, he had uncorked the genie. This was the inception of one of the most famous partnerships in merchandising history, a name recognized even 130 years later, known everywhere in the U.S., and even beyond its borders, because it catered to the little folks in the far-flung places with a simple marketing tool: the catalogue. If you shop online, and I admit I often do, as you open a new webpage with all its wonders, you know something of the magic tingle that our homesteading ancestors experienced when they got that catalogue. Suddenly a huge new world was opened before their eyes. I recently purchased a reprinted 1902 Sears and Roebuck catalog at a yard sale, just to look at the pictures and imagine what it would have been like to be a lonely housewife on a farm in Nebraska, dreaming of a swath of “multicolored” cloth for curtains, or a “plaid” ribbon, a guitar or a petticoat or a dining table or an oil lamp—all illustrated in stark black and white, each picture promising Improvement, Progress, Decoration, Health, Utility, Profit—in other words, Prosperity. In a rural landscape devoid of radio, television, phones, or movies, the Sears catalogue was the World Wide Web of its day. Once Americans in the remote heartland (Nebraska, Colorado, the Dakotas, Montana, Idaho) saw what was available to them through the catalogue, and realized it could all be theirs for cash or a money order and a short waiting period, the fortunes of Sears and Roebuck were assured. For who would not long for their own pair of Castrating Shears? 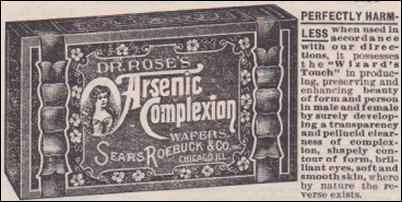 Or Arsenic Complexion Wafers, with their guarantee of new life for “even the coarsest and most repulsive skin”? There were two hallmarks of the Sears Roebuck and Co. formula: one was variety, and the other was reliability. In the early days, there was no shadow of shoddiness or mail-order fraudulence over this newly formed company; nor was there ever, really, to be. Though Roebuck dropped out early in the company’s history, Sears held on to the reins for most of his life. 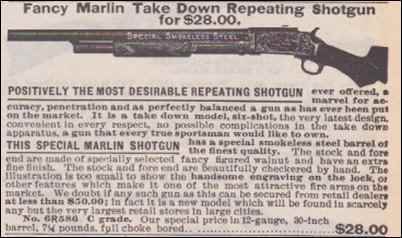 He enlisted the brilliant commercial mind of mercantile genius Julius Rosenwald, whose credo was “sell honest merchandise for less money and people will buy.” Wow, what a concept! It was Rosenwald who instituted the “money-back guarantee”—quite remarkable for a company whose transactions were all made at long distance. Rosenwald left the company a very wealthy man and became a philanthropist who, among other charitable acts, funded schools and libraries for poor black children in the South. Sears Roebuck, and Co. was built on moral scaffolding. By 1897 Sears Roebuck and Co. catalogue had gone from a rather small paperback to a large book, eight inches by eleven, with a gazillion super thin pages, and featured a display of shoes in real color. And as everyone knows, those pages had a secondary, but very important, use. As soon as the next new catalogue came into the home, the old one found its way to that little house out back. For the homesteader, the Sears products and the trains that brought them were nothing short of miraculous. By the 1920s, Sears Roebuck, and Co. sold cars (and printed a separate automobile catalogue), electric washing machines (what a blessing for our foremothers! ), silk stockings (what a blessing for our forefathers! ), and even school desks to help communities get local educational initiatives off the ground. In 1931 Sears Roebuck founded the Allstate insurance company, which operated on the same principles as its parent, the first such concern to offer personal service in drive-to offices instead of handling claims only by mail. It would be difficult to find any business concern today willing to make such a guarantee. 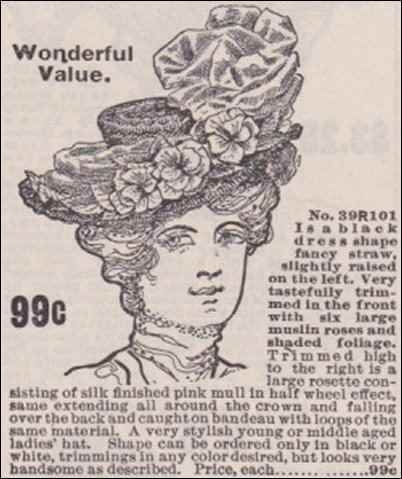 The 1902 catalogue changes product lines, blending forward every few pages. For the leisure time of the prairie dweller, it sold stereopticons. For the uninitiated, a stereopticon was a hand-held viewer with two photographs on a cardboard slide to be viewed through a magnifying glass. Because the two photos were just slightly different, the result was a three-dimensional view. Most stereopticon “shows” featured natural wonders such as tall trees or steep mountains that emphasized the scary sense of height or grandeur, much like a 3-D movie but in still frame. Sears Roebuck stereopticon slide shows included such hits as “The Passing of the Indian,” “The Assassination of President McKinley,” and “The Philippines and Our New Possessions,” comprising a genuine news outlet of its day—if you didn’t mind getting your news a few months or years late. And homesteaders on the Great Plains did not. Home entertainment could be even more complex and exciting for those who could afford it: the 1901 Edison Kinetoscope (Improved Model), precursor to the movie projector, was sold for $105.00. But the bulk of the catalogue was pure practicality, with many pages devoted to veterinary medicine; horse collars and blankets; buggies from simple to elaborate (you could purchase a Rural Mail Delivery Wagon or a Russian Bob Sleigh); and even a white canvas cover for what was by then called an “Immigrant Wagon”. Bicycles—Sears Roebucks own brands—were a big feature, with the boys’ model named Napoleon and the girls’, predictably, Josephine. Elaborate horns, searchlights, seats, locks, mudguards, and toe clips fill four pages of biking gear. For the sportsmen, there were fishing rods, boxing gloves, tennis rackets, dog muzzles, and hunting hats a la Sherlock Holmes. For the homesteading housewife, there were rat traps, lamp-chimney cleaners, carpet stretchers, nutmeg graters, and dinner horns. You had a choice between chamber pots or a “full siphon jet water closet” (read “toilet”). Tombstones, wheelchairs, bobby pins, cotter pins, safety pins, and “Bagdag draperies” all were on offer. One of the more fascinating, somewhat lurid sections of the catalogue featured medicines and “toilet items” of all kinds. There were “sure cures” for “the tobacco habit,” seeming to indicate that even a few generations back, people knew that tobacco was a harmful, nasty indulgence. A “perfectly safe and reliable cure” for the “opium and morphia” habit sounds too good to be true, as does Dr. Rose’s Obesity Powders and the mysterious “Electric Liniment” for rheumatism, corns, galls, frosted feet, and paralysis. The pleasant sounding Blackberry Balsam, we learn, “should be kept constantly on hand. Even the poorest in the land can afford it at only 22 cents a bottle.” It could get rid of dysentery, diarrhea, summer complaint, nervous headache, restlessness, wind in the stomach, and hysterics. You could buy mercury soap, turpentine liniment and, for your crops, almost any poison then extant. None, repeat, none of these remedies, cure-alls, devices, cosmetics, or cleansers listed a single active ingredient or contained a single warning about side-effects or contraindications. 1902, people trusted the printed word and they trusted Sears Roebuck. I admit, reading through the 1902 Sears Roebuck catalogue gave me a far different picture of what the average Great Plains homesteader may have been like, may have wanted or aspired to possess or become. Instead of gritty, self-sacrificing, Luddites inhabiting by choice a dark sod shanty or a rough rustic cabin, my mind was blasted with images of people, well, kind of just like us, pre-plastic and pre-micro-chip. They wanted books—recipes, uplifting stories, card tricks, parlor games, tales by Rudyard Kipling, family Bibles and the Encyclopedia Britannica. They could look at 3-D shows on their Sears stereopticons and cover their favorite horse or their newborn child with a Sears blanket. They could step out on a Sunday in the latest “ladies’ best enamel” lace-up shoe, a silk Eton Jacket and a “very nobby skirt”; and for the gentleman, a Derring, Milliken, and Co.’s “Gray Checked Cassimere Suit.” They could have lace curtains, a library rocker, an oak bedstead, and a New Queen Sewing Machine. In the nineteen thirties, toddler Johnny Cash moved with his family to a Roosevelt-inspired homestead project in Arkansas. “Johnny is quoted as relating that, ‘The last thing I remember before going to sleep was my mother beating time on the old Sears and Roebuck guitar singing ‘What Would You Give in Exchange for Your Soul.’” (see The History of Homesteading, Part IV). Johnny’s mom was doubtless playing a Silvertone. By the nineteen fifties, Sears Roebuck and Co. had moved into the cities. No longer merely housed in what the 1902 catalogue cover proudly describes as “One of the largest commercial buildings in the world,” in Chicago, or supplying its goods only to rural America, the company recognized that Prosperity had moved to town and most Americans had cars and liked to shop in real stores. Retaining the catalogues, and producing many small ones instead of one big one (I recall reading them up into the 1960s), they opened “big box” stores in most big cities. You could order from the catalogue and pick up your order from the Sears store. It’s no longer free to return items to Sears, and their “guarantees” no longer seem so ironclad. By the 1980s the company was in serious competition with comparable stores that undersold them, had their own brands, and, unlike Sears, featured big seasonal sales. The brainchild of Richard Sears and Alvah Roebuck has had its commercial glitches, but has stayed at the top tier with multiple online “catalogues” and consumer-friendly mall outlets. The day of the “real” Sears Roebuck catalogue (with its auxiliary usefulness as door stop and privy paper) is long gone, but for a by-gone generation of daring, determined and upwardly mobile homesteaders, it was a powerful piece of the American dream.